Would you like to set a code in your IVR for VIP support or set your IVR to allow you to 'Dial the extension now'? The Webhook can be used to let customers enter a pincode (followed by '#') before being connected. When the code is correct, the caller is automatically transferred. If the code is incorrect you can for instance play a voice prompt. This option is particularly useful for support numbers with an SLA. Customers receive a code and can always reach support. Another use case is to allow a caller to connect to an extension directly from the IVR menu. E.g. "If you know the extension number, please dial it now". The setup is similar setting up to the VIP PIN code. Check the checkbox 'Use IVR'. Complete the other details to your preference. You might want to read more about setting up an IVR here. 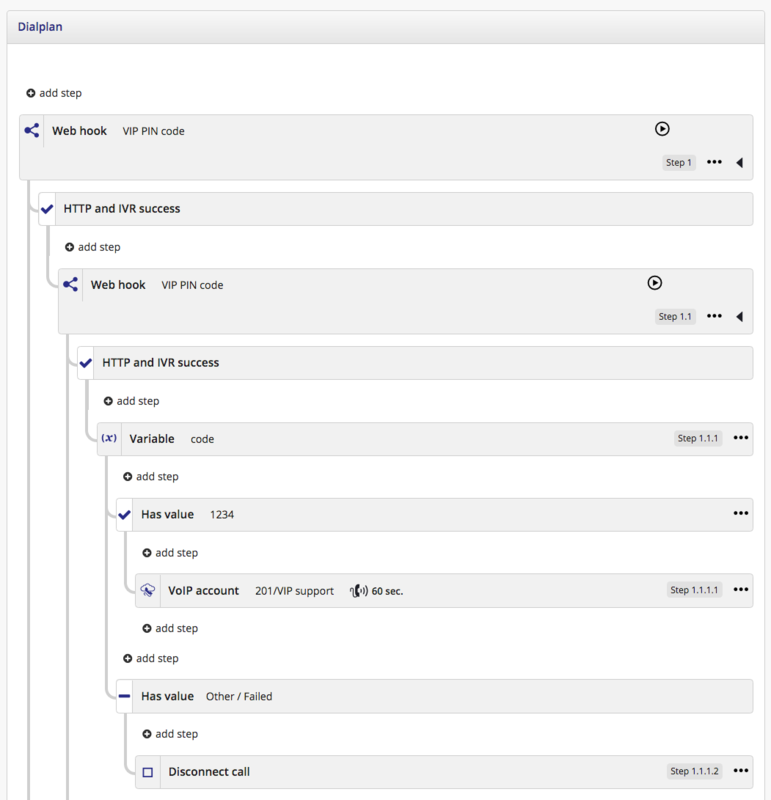 Add the Webhook to your Dialplan. You can configure the Dialplan as follows. Please note you must enter 'code' under variable. When the caller dials 1234#, he/ she will be transferred to VIP Support. When the caller dials another code, the call is disconnected.